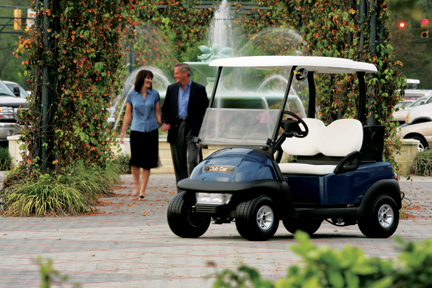 If you're looking for a golf car, find the model that fits your lifestyle and delivers maximum performance, style and longevity. But with so many models on the market, how do you decide what's right for you? 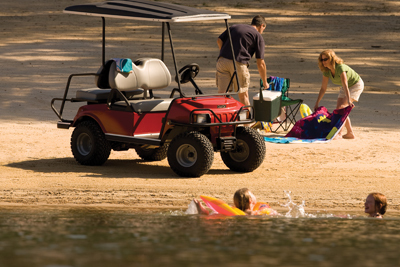 David Woodward, an engineer at Club Car, shares his insights on what to consider. 1. How Do You Plan to Use Your Vehicle? Golf cars are not just for playing golf. They're ideal for neighborhood transportation, light hauling, lawn work and hunting and for use by small business owners, RVers, equestrians, hobby farmers and many others. "Knowing how you plan to use your golf car is the first and most important step in the selection process," Woodward says. Either gas or electric cars can be used for neighborhood transportation, light hauling and yard work. Both are fairly easy to maintain. "If you use your vehicle for golf or short trips and want to go green, consider a quiet, zero-emissions electric car. Today's top models can get 20-30 miles on a single charge. Look for a car that includes a strong battery pack and a regenerative braking system that allows you to adjust the regenerative braking. This allows the car to optimize the energy reclaimed when stopping," Woodward says. For a longer range, go with gas. Gas may also be a better option for campers, hunters and RVers, as it can be difficult to recharge batteries when you're on the road. "Choose a vehicle with a powerful, name-brand engine, a big gas tank for a longer range and excellent hill-climbing performance," Woodard says. "Some manufacturers tune for mileage, but if you're using your car for rugged or hilly terrain, you'll want a car that's tuned for hill-climbing performance." This will depend largely on your budget. If you decide to buy a pre-owned vehicle, consider a factory remanufactured golf car. 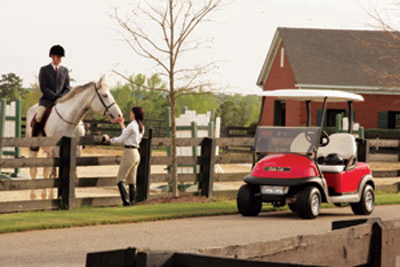 "Club Car's Gold Standard Remanufactured vehicles are disassembled down to their frames, then reassembled by trained technicians in our manufacturing facility. They're also equipped with many new parts, including batteries or engines, tires, bodies and cowls. And they carry a two-year limited manufacturer's warranty," Woodward says. Rust and body damage detract from a golf car's appearance and value, but many cars are built on heavy steel frames that rust due to salty air, fertilizer and other factors. "Look for a vehicle with a rustproof aluminum frame. If properly designed, these lightweight frames are as strong as steel, yet they last longer and maintain their appearance and function better than steel frames," Woodward says. Scratch- and weather-resistant body materials can also help your vehicle maintain its youthful good look. Creature comforts can make a big difference. Select a car with spacious seats, plenty of leg room, adequate in-car storage, cup holders and large, secure rear baskets to carry your gear. Ask about safety features and discuss any issues that particularly concern you with your sales representative. If you don't want to wrestle with a fixed front axle and endure a rough ride, consider a model with independent front suspension and rack-and-pinion steering. You'll experience superior handling, a smoother ride and a more exhilarating driving experience. "Choose a manufacturer that offers a wide variety of accessories made specifically for their vehicles. Tell the dealer how you plan to use your vehicle and ask what options are available for that application. Some manufacturers, including Club Car, operate custom solutions departments that can build just about anything you can imagine," Woodward says. Many golf cars are still equipped with tops that provide little more than shade. If you want rain protection, you'll need a canopy with a built-in drainage system that channels water directly to the ground. By eliminating standing water on the top of the car, these canopies keep you, your passengers and your gear dry. Shop for the longest, most comprehensive warranty you can find, and be sure it's backed by a network of authorized dealers with factory-trained service technicians. If you buy an electric model, check the battery warranty as well. 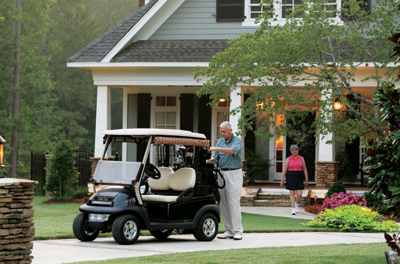 With a little thought and effort, you can purchase the golf car that fits your unique needs and delivers hours of trouble-free driving pleasure.